As an artist living on Mount Desert Island, who also works as a Park Ranger, I have accumulated well over 3,000 photographs of Acadia National Park. Obviously, you never go out into the park unarmed and thatâ€™s why I always bring my camera. To say the least I was excited to learn about this assignment, I thought, â€œthis is going to be right up my alleyâ€, yet when I reviewed my work I was shocked to see that there was no grand gem of a photo anywhere in my portfolio. Where was that award winner, that stunning vista? How could I have missed it? I instantly went out to try and find that iconic shot. Eventually it dawned on me that the true beauty of Acadia lays in the parkâ€™s visual complexity. There is no one â€œtrophy shotâ€ â€“ no Half Dome or El Capitan, no Delicate Arch or Old Faithful or a spectacular flume to frame in a viewfinder. Yet every year it attracts some of the best photographers from around the world, not to mention photo workshops and although coastal landscapes, fall foliage and Bass Harbor Lighthouse feature prominently, in my opinion, Acadiaâ€™s subtle beauty cannot be captured with just one glorious picture. The park is a plethora of photographic opportunities - no matter where you are or what you look at. There are woods, valleys, meadows, streams, bogs, mountains, rocks, cliffs, lakes and wildlife, not to mention the ocean. Itâ€™s not the grandeur that gives Acadia its value; itâ€™s the fact that, like a string of colorful beads, Acadiaâ€™s wonder lays in the context of the whole. 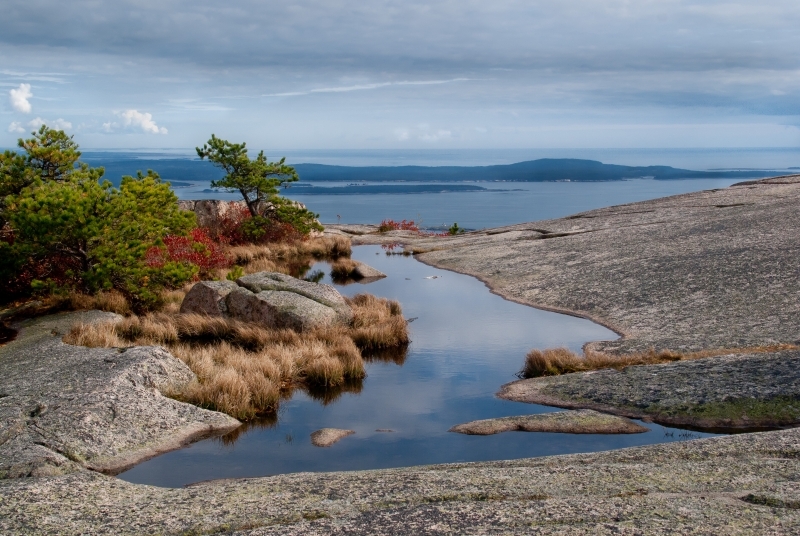 The work of the photographer in Acadia National Park is one of composition and selection. The photographerâ€™s mind will start running with all sorts of possibilities; it is the perfect place to be creative. I donâ€™t think one picture could ever do Acadia justice, but, who knows, maybe someday the Park will reveal to me itâ€™s one perfect gem. Unexpected oasis at the peak of Mount Champlain. Schoodic Peninsula can be seen in the distance.